Greece is a perfect wind/kite/surfing holiday destination. A Mediterranean ambience, hot weather, sandy beaches and plenty of vital wind at west coast for a generally good value create perfect combination for action holidays! There are no strong currents, no tides, no sharks, while the winds are constant and the shallow waters allow to all levels to practice their favourite sport. According to the CIA World Factbook, Greece has 13,67t km (8,498 mi) of coastline, the largest in the Mediterranean Basin! It consists of over 1.400 islands flung across the Aegean and Ionian seas, 160 of which are permanently inhabited. Cosmopolitan destinations with a high level of infrastructure and services, family units at reasonable prices but with high standards, and lonely beaches, totally unspoiled, endless beaches with big waves, shores with a variety of services to offer, promising absolute pleasure, satisfy every need. There is no such thing as a typical Greek Island or Village, as each has its own characteristics. Our destinations are chosen for their quality of water sports conditions. 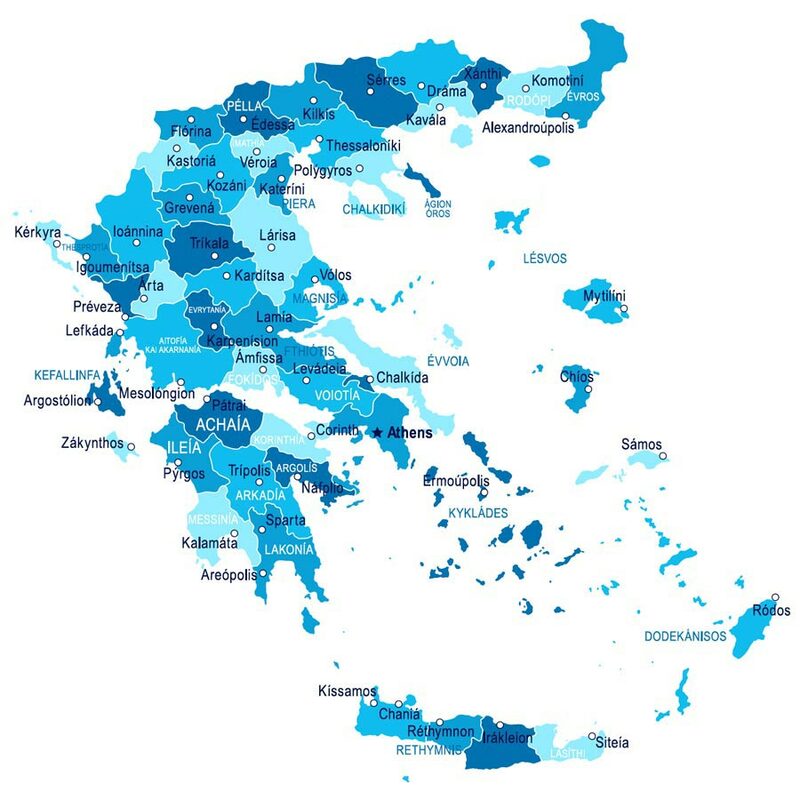 Greece is a country in Southern Europe, bordered to the north by Albania, Yugoslavia and Bulgaria; to the east by the Aegean Sea and Turkey, to the south by the Libyan Sea and to the west by the Ionian Sea, which separates Greece from Italy. The country consists of a mountainous, peninsular mainland jutting out into the Mediterranean Sea at the southernmost tip of the Balkans, and two smaller peninsulas projecting from it: the Chalkidiki and the Peloponnese, which is joined to the mainland by the Isthmus of Korinthos. 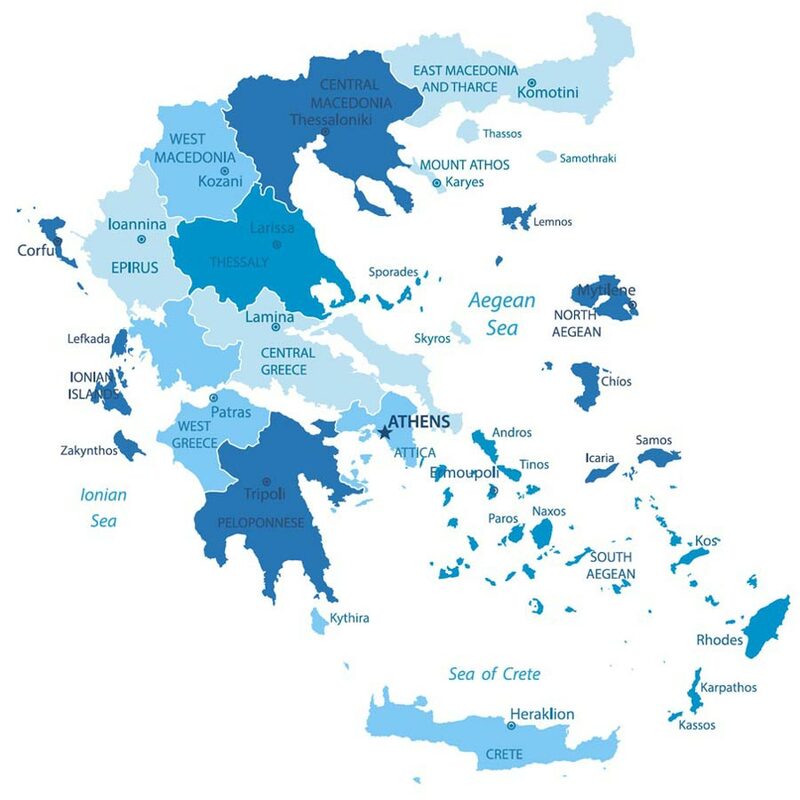 Greece also has many islands, of various sizes, the largest being Crete, Evia, Rhodes and Corfu; groups of smaller islands include the Dodecanese and the Cyclades. The etesians, "Meltemi", are the strong, dry north winds of the Aegean Sea, which blow from about mid-May to mid-September. 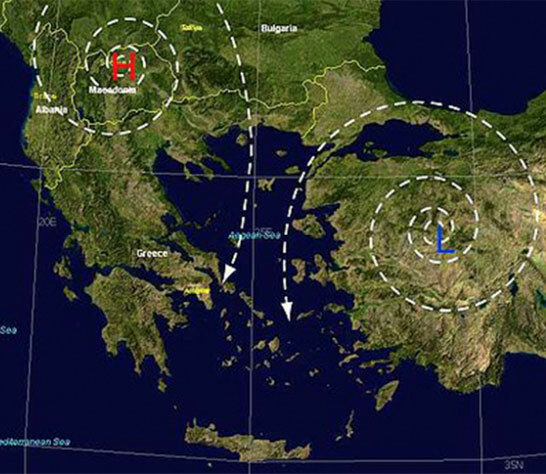 The Etesian winds are a dominant weather influence in the Aegean Basin. They are at their strongest in the afternoon and often die down at night, but sometimes Meltemi winds last for days without a break. Similar winds blow in the Adriatic and Ionian regions. Meltemi winds are dangerous to sailors because they come up in clear weather without warning and can blow at 7-8 beaufort. Some yachts and most inter-island ferries cannot sail under such conditions. However, they often provide a good, steady sailing wind favored by leisure sailors. The word etesian ultimately derives from the Greek word "etos" = "year", connotating the yearly fluctuation in frequency of appearance of these winds. Etesians have been described since ancient times; their Turkish and the Modern Greek names are probably a loan from Italian "mal tempo" = "bad weather". Though it is sometimes called a monsoon wind, the Meltemi is dry and does not correspond to an opposite wind in the winter. However, the etesians are distantly correlated with the summer monsoons of the Indian subcontinent, as it is a trough of low pressure into the Eastern Mediterranean region that enforces, if not causes, the etesians to blow in summer. A Mediterranean climate is sometimes called an etesian climate. Etesians are due chiefly to the deep continental depression centered over southwest Asia and blow from a direction which may be anywhere between north-east and north-west depending on local topography; meltemi weather is ordinarily fine and clear, the northerly winds tempering the fierce summer heat of the region. In the Northern Aegean Sea, the etesians blow as winds of northeasterly to northerly direction. Moving south, in the central Aegean, they blow as winds of northerly direction, while in the southern Aegean, the Cretan and the Carpathian sea, they blow as northwesterlies. The same winds blow in Cyprus as westerlies to southwesterlies, being more humid.